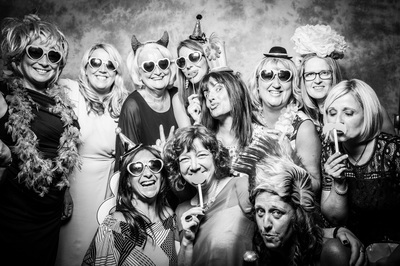 Whatever your corporate needs are for a photo-booth, we can customize to suit. Our booth, screens and backgrounds can all help get your message out to a wider audience. Our photo booth studio is a versatile 9 x 7 feet, so your guests will have no problem getting themselves into the photo. Unlike a traditional passport photo booth, this is an open studio which can cater for small and large groups of people and will never be a tight squeeze. ​Remember also, that there will be professional studio lighting and a 'real live photographer'. Your guests will enjoy the fun atmosphere that our photo booth generates and it’s a fantastic way to entertain your guests and to thank them for celebrating your party, event, birthday or wedding.